Earlier Today Power Star Pawan Kalyan Spotted at Hyderabad Airport when he was on his way to the closing ceremony of Jayate Kuchipudi Festival in the UK. 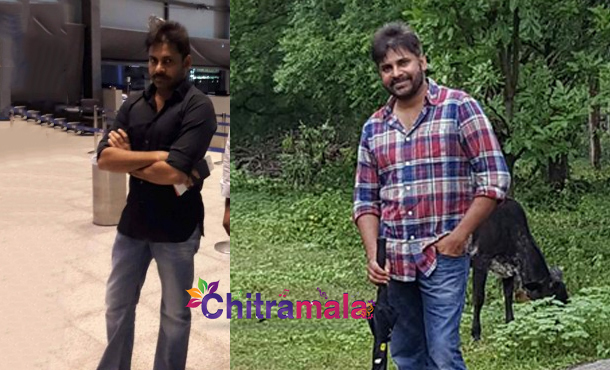 Yesterday his upcoming film’s producer Sharath Marar shared a pic of Pawan Kalyan standing in his farm, while the actor appeared with beard yesterday. He got rid of it which can be seen in today’s photo of his at an airport. As for the reports, UK Telugu Association invited Pawan Kalyan as the chief guest for the closing ceremony of Kuchipudi Festival’s 6th Anniversary Celebrations. UKTA’s team has made grand arrangement’s for PK’s tour. The event will start tomorrow evening at Troxy, London. Power Star Pawan Kalyan’s untitled upcoming movie with director Dolly will begin its shooting schedule after the return of Pawan Kalyan from the London event. This upcoming film is said to be a love story in faction backdrop. The music sittings have been already started and music composer Anup Rubens has already composed three songs. More details about the film will be out soon.